For the Nualolo Trail you will start at Kokee Ranger Station. While there, we recommend you check the board at the station for closures and other important information. If you're looking for a full-day hike, consider making the Nualolo trail the first part of a three-trail trek. Near the end of this trail is the Nualolo Cliff Trail which will take you over to Awa'awapuhi Trail (another great hike). If you plan to hike this "loop" trail, please make note that the trailheads are 1.5 miles apart, so the distance between should be added to your total mileage unless you are able to catch a ride between them. If you are hiking between the trail heads, we are now advising hikers to park at Awa`awapuhi trailhead and hike the road down in the morning BEFORE they start their hike; thus allowing them to conclude the hike at their vehicle (versus having to then hike the final stretch at the end). Either way, it's definitely wiser to hike the trails in a clockwise manner, ending at Awa`awapuhi so as to ensure you are uphill from the Nualolo trailhead and can hike down to your vehicle. If you have a car shuttle then you can start at the Awa'awwapuhi trailhead. You can view the loop trail by opening Google Earth and viewing our Nualolo and Awaawapuhi Loop Trail map. The trail starts off at approximately 3,660 feet with a short uphill along a series of switchbacks - you'll huff and puff until about 1/4 a mile in when you reach the top of the ridge. Then you get to head back down again. Be careful if it's wet, as it can get slippery along this stretch. At a half-mile in the trail will finally level off and you'll be surrounded by a number of ferns, karaka nut, and ohia trees. Keep an eye out for local birds; this is a great place to do some birdwatching. If you're lucky, you might even catch a glimpse of the 'I'iwi. When you've reached the one-mile point, you'll pass through a couple of grassy areas among some ferns. Another mile (2 miles in), you'll begin to notice the vegetation change. The rain isn't as plentiful here and if you've been hiking any portion in a mist or the rain, it'll likely get drier from here on out. As you gaze out at the ocean, you'll notice Niihau and Lehua islet. Niihau is the last remnant of "old Hawaii." The residents speak Hawaiian and no visitors are permitted without prior approval. At this two-mile point, you'll bear north and cross a narrow saddle. The views here are incredible, but be sure to watch your step. Shortly after this point, the footing can get tricky through a series of deep clay-like ruts. Do not get the dirt on your clothing, it'll never come out! After you cross another narrow saddle you'll climb steeply for a short segment before you reach a narrow ridge surrounded by vegetation. The views are really starting to get good now. At the three-mile point, you'll come to a junction with an old hunters route. Bear right to continue the trail. Don't let the steep slot that comes next deter you; keep going until you reach the junction of Nualolo Cliff Trail. If you're up for a long day hike (and don't mind hiking 1.5 miles back to your car at the end), you can always take Nualolo Cliff Trail over to Awa'awapuhi Trail. But for now, keep going straight to the Vista. You don't want to miss the views there. The Lolo Vista Point is a little more than a quarter mile from this juncture. It's windy out there, and the cliff isn't made of the most stable soil, so use extreme caution. If it has rained recently, you may want to skip this last part of the trail altogether. The views from the junction are wonderful as well, so don't risk it if it's wet. In the event it's dry and you are fortunate enough to make it out to the Lolo Vista Point, the views speak for themselves. The views of Nualolo Aina Valley are simply breathtaking! This is your reward. Now it's time to head back. You're now at approximately 2,234 ft. above sea level and no doubt you've thought about having to regain the 1,400+ ft. you dropped on the way down. If you have extra water, this may be the time to leave some of it behind. As we noted, if you've planned ahead, the Nualolo Cliff Trail and Awa'awapuhi Trail are a great way to improve on an already great hike. Just remember you'll end at a mile and a half up the road, and need to hike back down Highway 550 to the Ranger Station (hey, at least it's downhill). Use extreme caution hiking along the road. It's narrow and many folks drive faster than they should along this highway. As noted above, a tip we've heard and followed is to actually park at Awa'awapuhi early in the morning and then hike down to the Nualolo trailhead. This way, you avoid hiking on the road when there is a lot of traffic and when you're done, you're already at your car (which you'll probably be thankful for). Another trail that offers similar views of NaPali and yet another photogenic valley is Honopu Ridge Trail, which is a few miles further up the road (Highway 550). Don't forget to check our Kokee State Park Hiking page for information on all the incredible trails inside the park. On that page, we've also posted a map of the entire area (Kokee and Waimea State Parks) for you to download and print out at home. The Kokee Lodge and Museum will also have maps available, but we'd definitely advise you to go ahead and review the map and become familiar with the area. The crisscrossing of trails and 4x4 roads can be confusing at first, but once you select your routes, it's not too bad. The Garden Isle truly is a marvel of Mother Nature... there are so many sights to see, trails to hike, and adventures to be had. 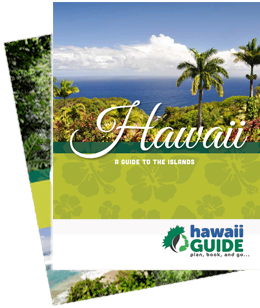 Here at GuideofUS- Hawaii, we have explored on our own and with some of the best guided tours available. And trust us when we say that with a guided tour, you get to see and experience things in a way you simply cannot do independently. Here are some of our favorite Kauai guided tours, as well as helpful maps to get you oriented. Enjoy!